Our Products >> Fiberglass Spear Splice - CLEARANCE! 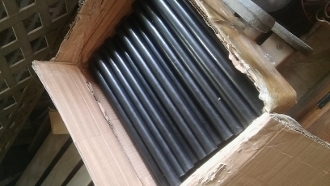 1 foot long section of solid Fiberglass Rod for splicing Fiberglass spears. Can be used to splice a 9' spear as a repair, so it breaks down for travel or to add a 3' section to create a 12' spear. They are 25mm(black or red) and fit the Light Duty Spears as is, but they need about 10 minutes of sanding to fith the Wood Grain Spears. Fiberglass Spear Splice - CLEARANCE!